What would New Year’s Day be without a recipe for black-eyed peas? We’ll get to that shortly. But first, let’s take a quick look back at the top 5 Diabetic Foodie dishes of 2011. This was, by far, my most popular post from the One-Pot Blogging Party for Emeril Lagasse’s cookbook, Sizzling Skillets and Other One-Pot Wonders that debuted in the fall. It seems as though everyone else is a sucker for pulled pork too. In early December, we had a virtual bridal shower for fellow Emeril One-Pot and Virtual Potluck blogger, Marnely (aka Nelly) Rodriguez-Murray of Cooking with Books. Nelly has a bit of a sweet tooth and she makes no secret of her bacon addiction, so I figured there would be plenty of desserts and pig represented at the shower. I “brought” this lovely, versatile chicken salad with pesto and grapes and it was a hit. After overdosing on turkey after Thanksgiving, I tried the winner of Food52‘s Best Beef Stew contest. I must admit I would never have thought to add anchovies to beef stew. This dish was good, but I recently made a different kind of beef stew with Moroccan flavors and butternut squash that I like better. Look for that recipe to be posted in early 2012. This wins the prize for being the first mushroom dish EVER on Diabetic Foodie. 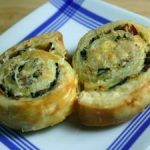 I am NOT a fan of the fungus, but when the fantastic folks at Marx Foods sent me some samples to try, I made a mushroom dish with puff pastry and chiles. I won’t say I’ve seen the light, but I did actually eat two of these swirls voluntarily. By far, the most popular dish on Diabetic Foodie during 2011 was this boneless tandoori chicken in spicy sauce from Sanjeev Kapoor’s How to Cook Indian. 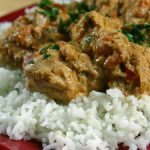 This dish has all of the flavors you’d get with a Chicken Tikka Masala dish in an Indian restaurant, but is a bit different in color and texture. Look for more Indian dishes in 2012 – this cookbook does have 600 pages, after all. I’d love to hear what your favorite Diabetic Foodie recipe was from 2011 and what you’d like to see more of in 2012. Now let’s kick off 2012! Have you ever wondered why people, especially those in the Southeastern part of the U.S., eat black-eyed peas on New Year’s Day for good luck in the upcoming year? Apparently, the practice dates back to the Civil War. Black-eyed peas were grown to feed livestock, so when Union troops invaded the South, they destroyed other crops, but left the pea fields intact. Black-eyed peas became a lifeline for Confederate soldiers and a symbol of good luck. Here’s hoping 2012 brings you health, wealth and happiness. In a large stockpot or Dutch oven, brown sausage in oil. Add onions, tomatoes and garlic pepper. (Note: the sausage I used was extremely spicy, so my version didn’t require additional seasonings. If you are using something like turkey or chicken sausage, you may want to add basil, oregano, garlic, jalapeños, etc.) Cook for 5-10 minutes until the mixture thickens slightly. Add cooked black-eyed peas and remove from heat. Place milk and water in large saucepan and bring to a boil. Whisking constantly, add polenta slowly in a steady stream. Reduce heat and simmer polenta, stirring a few times, for about 5 minutes or until thick and creamy. Remove from heat, cover and let sit for 5 minutes. Preheat oven to 350°F. Spray a 9- x 13-inch baking dish with cooking spray. Pour in sausage mixture, then spoon polenta over top to cover. Drizzle with olive oil and dust with Parmesan cheese. Bake for about 40 minutes or until bubbling and lightly browned on top. Below you’ll find 2011 wrap-ups from other fabulous food bloggers. 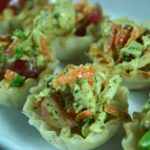 Thanks to Lora from Cake Duchess, Sanjeeta at Lite Bite and Junia of Mis Pensamientos for coordinating this bloghop. What a wonderful recap of 2011 of some of your scrumptious recipes here. Thanks for joining #Welcome2012 and making it a wonderful event. Hope to stay connected for more of foodie fun together in coming years! Your black eyed peas sound really good! I tried black eyed peas last year for the first time and just didn’t get into them, but I might just need to try them again! Thanks for the inspiration! Great recap darlin! I love it. 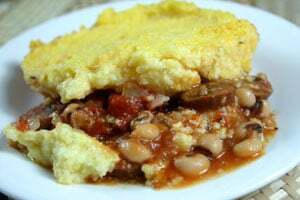 The black eyed pea casserole looks delish. Happy New Year!! Those Spicy Mushroom Swirls look so great! I have to get my hands on those ingredients ASAP! Happy New Year! So based on your comments about the black eyed peas, I added collard greens to my leftover hoppin john for lunch today. Tomorrow I’ll need to find me some cornbread. 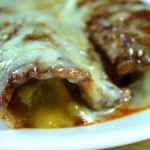 Yum…those enchiladas are calling my name! Great recap and wonderful dishes here. Happy to meet you through this virtual party! Happy new year!